If you spend any amount of time debating proponents of statism you’ll inevitably hear, “But who will build the roads?” Libertarians are often accused of being stupid, ignorant, and hypocritical since we want to radically shrink the size of government yet we apparently don’t realize that the government provides us with valuable services like roads. In a libertarian world, the meme goes, there would be no roads. We would all just be standing around scratching our heads trying to figure out how to get from point A to point B. How childish can libertarians be? If you push back you’ll often find that people who hold this view have never stopped to consider whether there are better, more innovative and efficient ways to produce and maintain roads. It’s as if the fact that we’ve done it this way for so long is all the evidence we need to show there are no other ways to do it. One can imagine a world in which the government has monopolized shoe production for the last two hundred years. If you were to call for the elimination of the government shoe monopoly, rest assured someone would accuse you of wanting people to go barefoot. While my intuition tells me it wouldn’t be a profitable business model to put a toll booth at every intersection, there is something to be said about the need for a viable payment mechanism in the absence of taxation. Libertarians are usually not that forthcoming with proposals primarily because it’s next to impossible to predict the outcomes of the competitive process or exactly what innovations entrepreneurs will bring to market. Despite this, I’m going to put on my entrepreneur hat and offer up a proposal anyway. Before I do, however, I want to make the case against government roads which will strengthen the appeal of the solution I’m going to offer. Since this would be a really long post otherwise, I’m going to split it into two parts. In this part I’ll make the case against government roads and in Part 2 I’ll provide a proposal for how private roads could work. 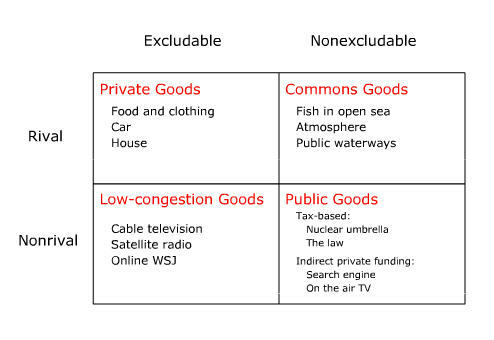 The economics textbooks I used in both undergraduate and graduate school bizarrely categorized roads as public goods. But why is this? Surely they wouldn’t say that just because they’re provided by the government, right? The economic definition of a public good is one that is both non-rivalrous and non-excludable and thus subject to the free rider problem. I would hope it is obvious to everyone that roads are neither non-rivalrous nor non-excludable. There is a limit to how much traffic a road can handle, anything over that limit and you get traffic jams. Hence, roads are rivalrous. They are also excludable, just look at any toll road. If you don’t pay, they don’t let you on the road. Economically speaking, roads fit into the category of private goods — those that are most efficiently provided by the market. So what is the government doing in the road business to begin with? Some people like to claim that roads (primarily local roads and collectors) need to be provided by government since they are examples of a natural monopolies. It’s easy to think this way, after all there’s only one road in front of your house. Absent competition, the owner of the road would charge you a king’s ransom just to leave your property. To the extent this would happen, it would not be due to the free market, but rather an improper allocation of rights. The relevant question is who was there first, the homeowner or the road owner? If the homeowner was there first, he should rightfully be granted an easement allowing him to leave his property and traverse the local roads and connectors to reach the paid arteries and highways that compete for his business. The owner of the local road would have to allow the homeowner go traverse the road for free (since charging would make him worse off) while retaining the right to charge outsiders and through traffic. If the road was there first, with people building houses or businesses alongside it later, it would retain full discretion in its pricing. Even then, the road owner couldn’t charge the monopoly price since it will be in competition with other roads for business or housing development along the flanks. It’s neglect of this type of analysis of property rights and easements that leads many to conclude that local roads are natural monopolies. In Part 2 we will take a deeper look at competition between arterials and highways. Every sector of the economy touched by capitalism has seen enormous change for the better. When I was a kid, if you wanted to make a phone call, you would have to find the nearest pay phone and dial 1-800-COLLECT. Now you just pull a 1/4″ thick computer out of your pocket and video chat with someone. Went I went on road trips with my parents, we would literally purchase a map from AAA and highlight our route from New Jersey to Florida. Today you say, “Ok Google navigate to Disney World” and you are automatically directed to your location. Yet, when I think about it, roads are almost exactly the same as they were when I was a kid. I have to struggle to name a single innovation. In fact, the only real “innovations” the government has come up with have made our lives more miserable — red light cameras, seat belt laws etc. When services are provided privately, businessman compete to, you know, actually serve you. Those that find new and better ways of doing this are rewarded with greater profits. Most assuredly private roads companies would have found a more consumer friendly way of enforcing speed limits than by having armed police hiding in obscure locations waiting to pull you over and extort money from you. And surely private road companies would have a better incentive to find more efficient traffic patterns. Take a look at this mind blowing video from Auckland, NZ. A power outage knocked out the traffic light and look how much better traffic flows without the light! Not surprisingly, the government turned the light back on after power was restored. Again, the government is so stuck in its ways that it would never come up with an innovation like this. My guess is there are tens of thousands of innovations just like this one that could be implemented all over the place, but never will be because of lack of incentive. The problem is the government just does not regard us as its customers. It monopolizes the roads, does the bare minimum necessary to provide a minimally functional service, then demands we be thankful and pay our taxes — or go to prison. Next time you’re in the DMV ask yourself, who is serving whom? Edit: Based on feedback, I should probably clarify that I do not deny that government run enterprises can find improvements, such as a new type of asphalt. However, it is a core proposition in economics that competing for-profit businesses will have a greater incentive to innovate than a tax-funded monopoly. That really shouldn’t be controversial. Not only does the government provide us with terrible service, but it has practically run the infrastructure into the ground. The American Society of Civil Engineers has given the United States a D+ for the state of its infrastructure on its latest report card, noting that it is “poor” and “at risk”. It’s reported the amount of money that would be needed to address the problem is a staggering $3.6 trillion (obviously this number includes more than just roads, but the same arguments apply to all infrastructure). Now I’m not in a position to comment on the accuracy of that figure, but I’m going to assume it’s at least in the correct ballpark. The relevant question is, whose fault is this? The left loves to place the blame on conservatives for prioritizing “tax cuts for the rich” over infrastructure. But the reality of the situation is that the government has monopolized the infrastructure, prevented private businesses from competing in this sector of the economy, then has proceeded to run it into the ground. Nobody deserves any blame for this but the government and advocates of government provision of infrastructure. After all, what do you expect to happen when you channel funding through the political process? In the best case scenario, the funds for infrastructure spending will have to compete with funding for schools, entitlements, health care, etc. In practice it also competes with funding for war, the military industrial complex, pork barrel projects, political corruption, you name it. Does anyone really expect to get the correct amount of funding from such a defective process? On the other hand, when have you ever heard of private industry underinvesting in whole sectors of the economy to the tune of trillions of dollars? Why don’t we see chronic underinvestment in textile manufacturing? The answer is because these funding levels are determined outside of the political process, by profit and loss, rather than political logrolling. Would the infrasture be in such terrible shape if it were provided by competing businesses? Not a chance. How does the government know the proper amount to invest in infrastructure? How does it know that resources should be allocated to widening a highway as opposed to say, building another school? How does it know that Park Avenue should be torn up and repaved as opposed to the Brooklyn-Queens Expressway? The answer is — it doesn’t. What we want is for resources to be allocated to their most highly valued ends. The problem for the government is that value is subjective. It only exists in the human mind. The government doesn’t have any way of knowing if a repaved Park Avenue is more valuable than a repaved BQE. Sure it has various models it uses to determine when roads should be repaved due to wear and tear or the expected delays from construction, but none of that is rooted in value. The decisions may as well be purely arbitrary. In the market, by contrast, people’s subjective preferences manifest themselves through profit and loss. Businesses use this data to make allocation decisions ensuring that resources are directed to people’s highest valued ends. The decision to repave Park Avenue or the BQE or to use the funds to build a new school, will be made based on which ever will create more value for society. The government, lacking the profit-loss mechanism, simply doesn’t have access to this data and will inevitably allocate resources to lower valued ends than would private businesses. The informational problems don’t end with investment decisions either. They also extend to rules governing the roads. What is the proper way to determine what the speed limits should be? If you said: “collect data about traffic accidents and vehicle speeds and use complex statistical analysis to determine the safest maximum speed to drive”, you would be wrong. Again, what we care about is value. That is, satisfying the preferences of our customers — those who drive on the road. Maybe people would prefer to drive at 80 mph on a highway even though it means taking on extra risk of an accident. Maybe people would prefer to arrive at their destination slower if it means bearing less risk. The speed limits the government imposes are purely arbitrary. Completely divorced from consumer preferences. Given that we drive on the roads almost every day of our lives, my guess is that enormous value could be created simply by setting speed limits in accordance with people’s actual preferences. The same could be said of all the government’s other rules. All of which are equally arbitrary. How much of your day is spent sitting idly in traffic? In D.C., Los Angeles, and San Francisco commuters spend more than 60 hours a year stuck in traffic. That adds up to over a week of work time each year and we have road socialism to thank for it. While we indirectly pay taxes to finance the roads, they are essentially free for everyone to use as much as we want without any sort of rationing. Given that they can only hold so many vehicles at one time, it’s not surprising that traffic grinds to a screeching halt as everyone pours onto the roads during rush hour. There’s a term for this — Tragedy of the Commons. By failing to effectively ration roads (indeed by not rationing at all) the government is directly causing traffic jams and creating a major inconvenience in the lives of everyone. Not to mention all road rage and bird flipping. Going back to the market economy, prices are used to ration scarce resources. When the demand for a product increases beyond what a business can supply, it raises its price. If demand fall below supply, it lowers its price. By this method we avoid the tragedy of the commons (at least in those areas not perverted by government). Scarce resources are effectively rationed ensuring that those who value them the most receive them. If roads were provided by private businesses, I can guarantee they would employ congestion pricing. As demand rises during rush hour, the road companies would raise prices, incentivizing people to carpool, ride a bike, or take mass transit. Notice this is exactly what the left has been browbeating us to do for years. The only reason we don’t do it already is because of the government’s mismanagement of the roads, which they support. Additionally, during the middle of the night, when demand is at its lowest, road companies would lower prices. A side effect of this would most likely be that most trucking would be done at night as businesses would pay less to ship products if truckers drive at night rather than during the day. This would mean that roads would primarily be available to passenger vehicles during the day. The overall result of congestion pricing would be to smooth out traffic fluctuations and to permanently eliminate traffic jams and the associated pollution that goes along with them. Unlike other government blunders which we are often insulated from, we drive on the roads and experience the direct impact of this policy failure nearly every day of our lives. Most people just assume traffic jams, potholes, endless construction, speeding tickets and the DMV are just facts of life. They live their lives never considering the possibility that there is a better way and then mock and criticize those who don’t show appropriate reverence for the government road monopoly. Yet, when you sum it all up the amount that our daily lives would improve if the roads were privatized is truly staggering.